Thirsty Pilgrim: Zooming In to a Familiar Spot On The Global Beer Influence Map. Zooming In to a Familiar Spot On The Global Beer Influence Map. There is an international marketplace of beer ideas, and we usually oversimplify it. For example: One arrow of influence might point from the U.K. to the U.S., and then another arrow would point right back. Taking a step backward and looking at the global picture, everybody is influencing everybody these days. A more accurate way to think about the aforementioned marketplace would be one of those airline route maps, with the number of curvy lines multiplied many times over. 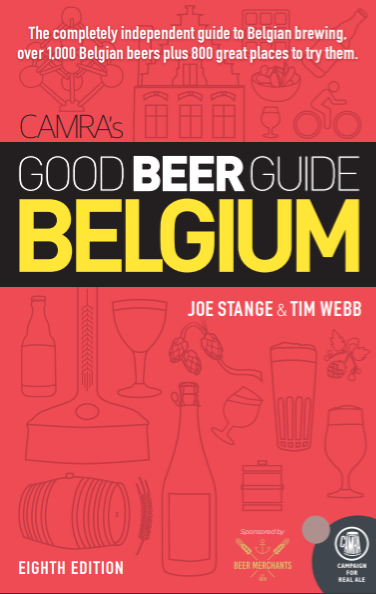 Back to the simple view: British ales have had massive influence on Belgian ones over the years. It is nearly impossible to overstate that fact, which goes well beyond the Belgian pale ales, stouts, Scotch ales and other familiar categories. Eugene Rodenbach, or so the story goes, learned about barrel maturation and blending of young and old ales when he visited England. He then had a taste for that sort of thing when he took over his father's brewery, creating a distinctively tart beer that has inspired many others. Why do I mention all this? Sometimes it helps to go back and dip into the old well. Recently I asked Belgoo brewer Jo Van Aert where he got the idea for his new Saisonneke, which weighs in at a light and hoppy 4.4% strength. I expected him to mention something about how Wallonian saison was traditionally lower in alcohol. But that's not what he said. ... where I tasted different great beers from relatively young breweries, with extremely low alcohol percentages. I personally prefer drinking low alcohol beers, but there are not much options on the market. Brewing low alcohol beers is also the most challenging from a technical point of view. I talked to several U.K. brewmasters to find out about their “secrets” on getting so much body with such a little alcohol percentage and used some aspects for my Belgoo Saisonneke. Their main thing is, as you know, their cask ales method, where fermentation has been stopped by cooling after three to four days down under 10°C, with as a result lots of unfermented sugars and thus body, which would be impossible to do in Belgium. I tried to get the body by using different malts with more proteins and taste, an above-average European bitter hopping [33 IBUs] and an exuberant late- and dry-hopping (250g/HL) with European aroma hops with a discrete citrus touch. Van Aert suggests that cask ales are "impossible" in Belgium, but I think he means "very difficult." After all, there have been cask ale sightings at Moeder Lambic Fontainas and a handful of festivals over the past several years. That global influence map is getting more complex, but those tried-and-true routes remain as well-trafficked as ever. 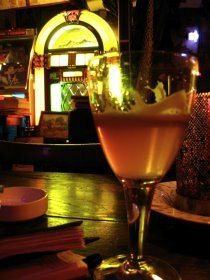 The photo comes from the Brussels chansons bar Goupil le Fol, where I tasted Belgoo for the first time nearly four years ago. The name saisonneke was chosen because it’s light, hoppy and thirst quenching. In the tradition of the Wallonian saison used for the harvest workforce. The “eke” was chosen because it’s lighter in alcohol than most existing saisons in the market and because of the nice French/Flemish mixture. How do I get ahold of someone who runs this? I am trying to start my own beer at home in Turrialba but I dont know where to het the supplies, i.e. malt and barley etc. Hi Damon, I also sent you an email. There are two places in San José: TicoBirra is the homebrew shop and Bodega de Chema is an all-around craft beer shop/clubhouse and also sells some ingredients. Some googling should turn them up.